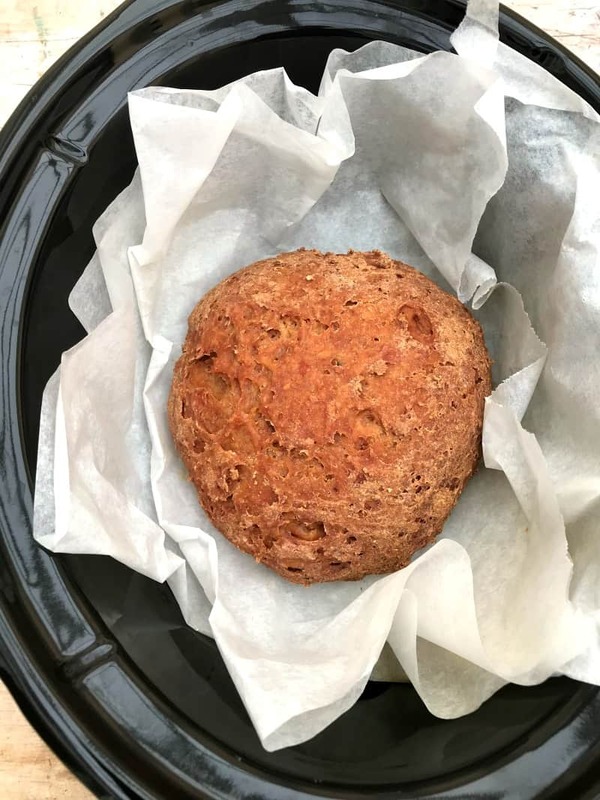 Have you baked bread in your slow cooker before? I find you can get a really good crust so I use my slow cooker for bread quite often. It is great to be able to make soup in one slow cooker and a loaf of homemade bread to serve with it in another! 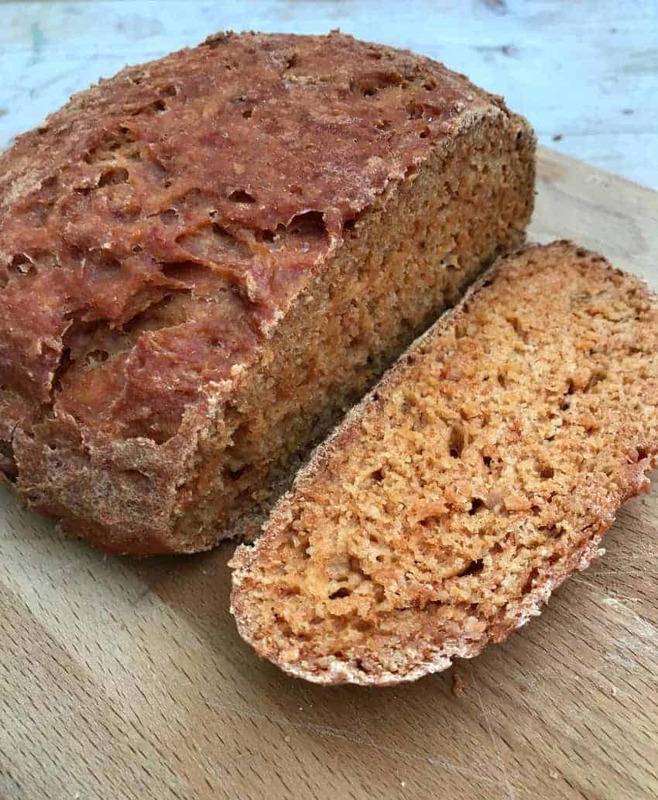 This slow cooker tomato paprika bread is brilliant served with veggie soup or alongside a big bowl of chilli or stew too, so it is really versatile. 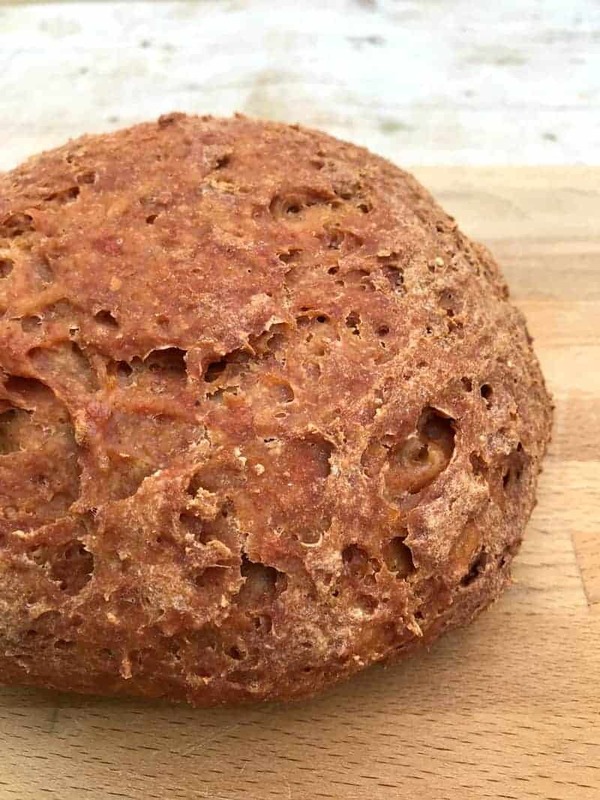 No oven was used in the making of this bread! Yes that’s right, the tasty crust you can see here was just from the slow cooker. How is this possible? Well a tea towel under the lid stops water dripping onto the loaf and means it stays pretty dry inside your pot. If the top seems a bit wet and soft you can turn over the loaf and the contact with the base of the lined slow cooker pot will brown it off. For this loaf I only turned it over for the last ten minutes. 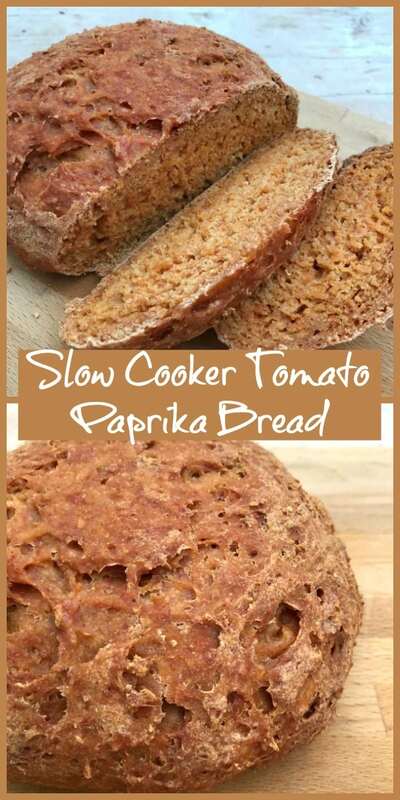 This slow cooker tomato paprika bread is a no-rise and no-yeast bread, it is so easy to make. I used Greek yoghurt in this bread, and chose 0% fat Greek yoghurt too as this has zero points on WeightWatchers Flex/Freestyle. So it is healthy too! Simply make your dough and pop it in the lined slow cooker pot. I used a couple of pieces of baking paper, both folded. Cook on high for a couple of hours and the loaf below will greet you when you lift the lid! I loved the artisanal rustic look of this loaf. Nearly as pretty as a sourdough loaf but a lot less hassle to make! 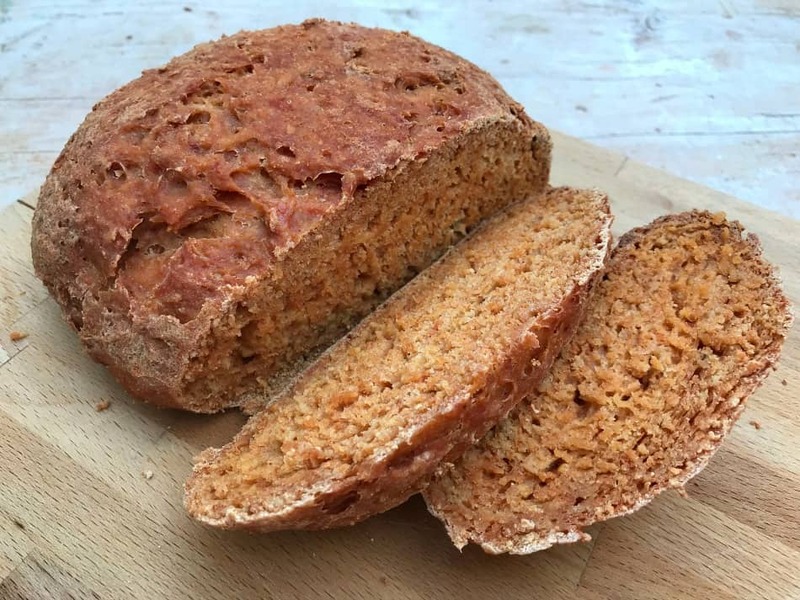 As I chose tomato and smoked paprika flavours for this loaf, it has a lovely reddish tinge. The flavours go so well with a spicy soup or a pot of chilli or just buttered with salads and cheese, however you prefer it really. For lots of sweet slow cooker baking make sure you look in my visual recipe index. Sending this over to #Bakeoftheweek with Mummy Mishaps and Casa Costello, check out some delicious bakes over there including Jenny’s delicious creme egg surprise cake! Place the flour, baking powder and salt in a large bowl. Add the Greek yoghurt, smoked paprika, tomato puree and a couple of splashes of water (if needed) and stir until it forms a soft dough. 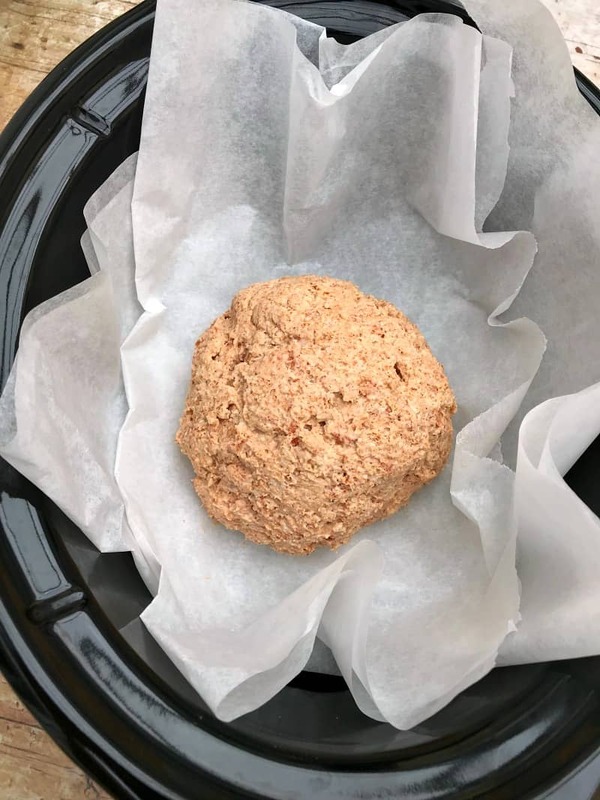 Place a folded piece of baking paper in the slow cooker pot. Fold another piece, place the dough on it and form into a round. Cook on high, with a tea towel or a few pieces of kitchen paper under the lid to catch drips, for three hours. For the last ten minutes, turn the loaf over to brown the top. Use the baking paper to lift the loaf out. Cool slightly then slice and serve. Who would have thought this worked? 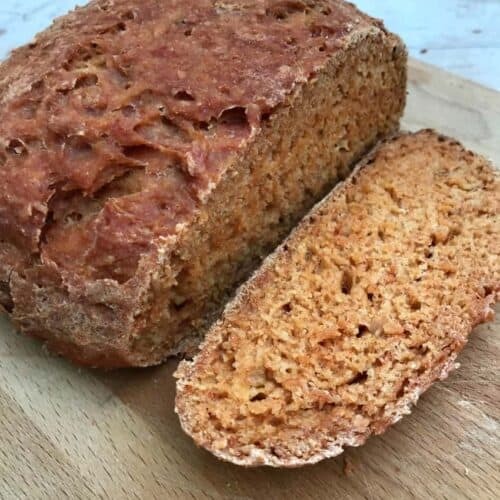 I was searching for a tomato bread recipe to go with a winter soup and found your amazing recipe. Thank you so much, it tastes delicious (we had it with roast butternut and thyme soup).